Michael Heizer's Double Negative, shot from the western edge. © Brent Holmes, 2015. Nine Nevada Depressions (1968) — sculptures scooped from dry lakebed — inaugurated Nevada as Heizer's go-to medium. Double Negative followed the next year, spanning a canyon, gouging 1500 feet of mesa, and displacing 244,000 tons of Nevada sandstone and rhyolite. (It's longer than the Empire State Building is tall.) 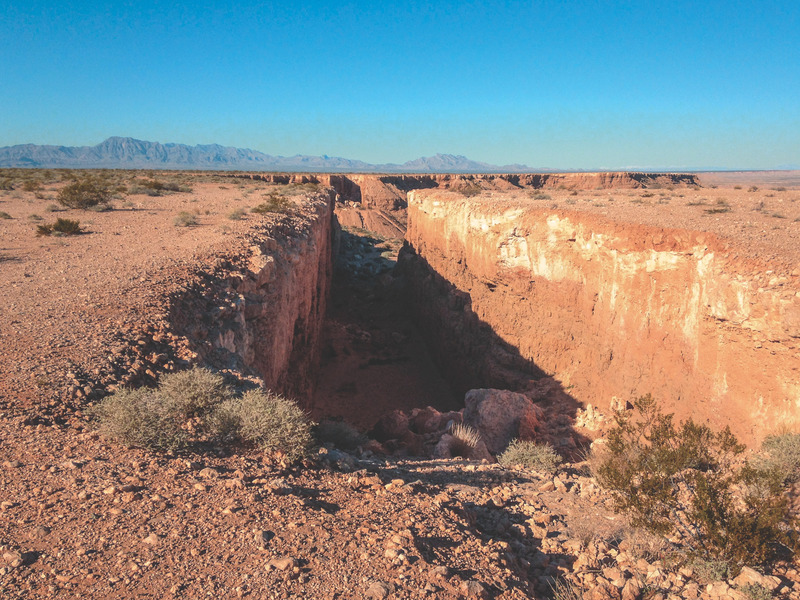 In 1997, Germano Celant's 550+ page opus, Michael Heizer, credits Nevada with provisioning landscape for more than a third of the book's photos. And just last year, Heizer's colossal City — a sculpture complex worthy of pharaohs — landed safely inside the 704,000-acre Basin and Range National Monument signed into law by President Obama to protect Nevada wilderness. Art using Nevada as material is tricky to commodify. Acreage and vista — the format of the Land Art movement — can't be hung in a museum, or shown in a gallery, or crated for a trip to Sotheby's. At the outset of his Land Art career, Heizer still exhibited paintings and sculptures, but the frequency of his shows diminished then halted. While health problems were a factor, City gobbled up most of his time, attention, and funds. The enormous site — 1.25 miles long and about a quarter mile wide — is the largest sculptural undertaking in U.S. history. It outsizes James Turrell's Roden Crater installation (Arizona), Walter de Maria's Lightning Field (New Mexico), and Robert Smithson's Spiral Jetty (Utah). The jewel in the crown of the Land Art movement, Heizer's City — as yet unfinished — is said to be the largest sculpture project by a single artist of all time. But it was more than maniacal dedication to a gargantuan artwork that led to the artist's quasi-withdrawal from the art world. Heizer is constitutionally reclusive. For the past few decades, he's lived in a cinderblock house adjacent to City, an hour from the nearest small town and three hours from Las Vegas. A man who willfully makes his mark on the rangeland of central Nevada with coyotes, cattle and the occasional cowboy for company isn't hankering after the limelight. Heizer's recent exhibition at Gagosian Gallery, Altars (May 2015), was his first solo show in New York in 21 years. "Post Historic Screenprint No. 1" (2014). Courtesy of Durham Press and the artist. All this makes the current exhibition of Heizer prints at MCQ Fine Art in Las Vegas rare and appropriately local. On display through August 13, the show is everything that Heizer is usually not. Not large. Not overwhelming. Not made for an incremental, step-by-step viewing. No special footwear required. No chest thumping. Seen in the cozy, mid-mod confines of the gallery, the prints reveal the artist's softer side. Accompanying the shift to personal scale is a shift in style — Heizer's uncompromising exactitude is everywhere present, yet tamed by a gestural lyricism that only the artist's hand, not a bulldozer, can supply. "Post Historic Screenprint No 1" and "No 2," are standouts. Completed in 2014, the 46-by-46 inch works feature a tribal palette, nervy graffiti, and images of stones seemingly vibrating right out of the picture plane. The uncanny perspective derives, in part, from the twenty-some screens (22 for No 1 and 33 for No 2) and up to 23 colors in the printing process, coupled with a 14-year compositional gestation. While the stones appear to be scaled down from sculptural studies, Heizer actually did the opposite: scaled-up small prehistoric tools, monumentalizing their mass and dramatizing their presence. The artist's affection for stone is frequently linked to the Indiana Jones-years of his youth when Heizer accompanied his anthropologist father, a recognized expert in building methods of pre-Columbian peoples, to archeological sites throughout the Americas, and to Egypt. Decades later, major installations like Levitated Mass (2012), the whopping 340-ton boulder permanently installed at the Los Angeles County Museum of Art (LACMA), and the impressive "Asteroid" (2000), the relatively demure 12-ton ore rock recently exhibited at Gagosian Gallery, are often described in a nature-vs.-culture frame. The religious implications of Heizer's work — he's arguably a stone worshipper if ever there was one — are downplayed or deliberately overlooked. But at MCQ, they're hard to miss. "Post Historic Screenprint No. 2" (2014). Courtesy of Durham Press and the artist. In "Post Historic Screenprint No 2," Heizer depicts six stone artifacts in levitating perspective, as if animistic powers were fueling lift-off. Arrayed in two rows — one black, the other burnt sienna — the palette is the same one used in ritualistic rock art and ceramics by ancient peoples. Loose, multiple contour lines surround the stones like discharging auras, transforming fragments of geology into fetishes worthy of a shaman. 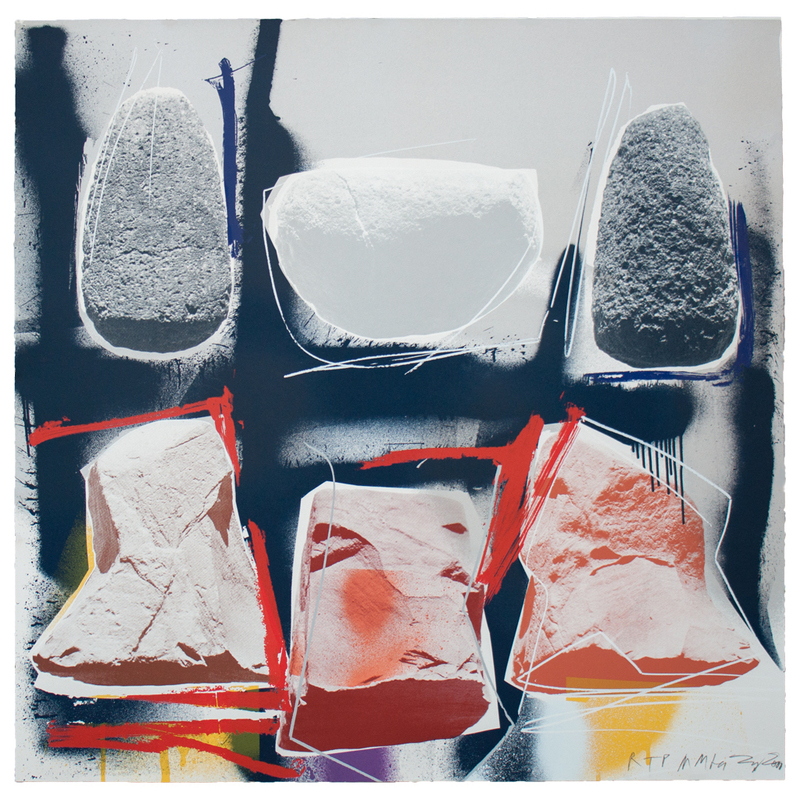 Another striking print, the 35-by-94 inch lithograph "Levitated Mass" (2015), portrays a triangular LACMA boulder bobbing in graffiti currents. 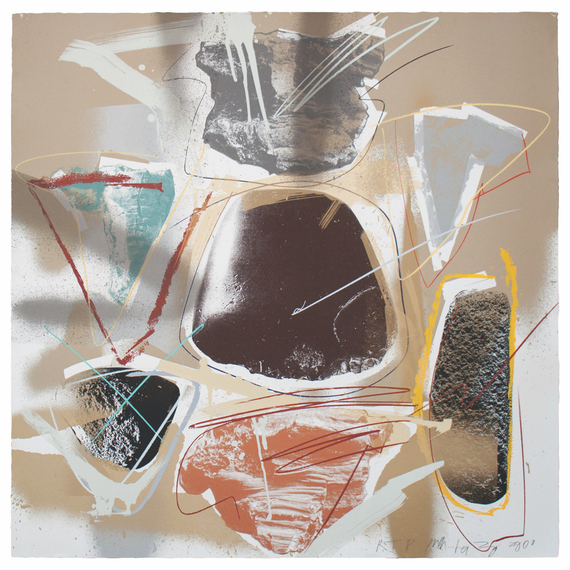 Quick gestural lines, loose crosses, splotches and circles ping both Heizer's early geometric paintings as well as the motorcycle-track drawings he made on a dry lake bed near Las Vegas almost fifty years ago. But Heizer's marks dive further back in time to petroglyphs (drawings incised on rocks by pre-literate peoples) and even further, all the way to the Paleolithic, when ancient artists superimposed images on cave walls. Suspended in the compendium of mark marking, the boulder seems to commandeer the energy fields generated by its mass. For millennia, peoples have revered stones as sacred objects and identified stone sites as places of worship, largely because of the woo-woo purported to emanate from the minerals. While Heizer is far from being a high priest of a theo-lithic cult, he is definitely a metaphysician who seeks to provoke awe in the viewer. His efforts culminate in City, with its riffs on meso-American and Egyptian sacred architecture. The prints with their animistic stones provide a window on the monumental works, portable Heizers with accessible views. Luckily for Nevada, we've got these works-on-paper for a while. The stones are keepers. An abbreviated version of this post appeared in the Las Vegas Weekly, June 30 - July 6, 2016 .